In recent years, the newest development in home comfort heating has made it's debut. Most furnace manufacturers have put out on the market their version of the high efficiency modulating gas furnace. The Hvac Experts claim that both multi-stage and modulating gas furnaces, not only save your hard earned dollars, but produce the greatest levels of comfort in your home. With AFUE (annual fuel usage estimate) ratings as high as 98.2%, a modulating furnace will certainly cut down on your gas bills. The modulating furnace varies the amount of heat produced, by increasing or retarding the output of the burners, depending on the heating requirement of your home, at the time. At milder outdoor temperatures, your home loses less heat to the outdoors through the walls and ceilings. The furnace will produce less heat. As outdoor temperature drops in the evening, and more indoor heat is needed, the furnace gas valve and blower will automatically ramp up to higher-output. Another pleasant feature is the furnace's ability to balance the heat in your home. The furnace will cycle on slowly before room temperature drops significantly, producing a more consistent room(s) temperature. Depending on the call from the thermostat, the output will increase or decrease, in increments, so that indoor temperature never varies more than 1 or 2 degrees from the thermostat's set point. The furnace runs longer with fewer on/off cycles. This characteristic will save money at the electric meter, as well. These modulating gas furnaces are also equipped with a variable speed ECM blower motor. During low-output mode, the blower motor will run slower, less cfm output, yet the air delivered into the conditioned spaces still feels hot. An ECM motor ramps up from zero output to the predetermined needed output slowly and quietly. At 30% output you may not even notice that your modulating furnace is even running. In a well insulated home, you will notice that the temperature highs and lows, and the rush of airflow across a room have magically disappeared. Single Stage Furnaces: Usually 80% AFUE or less. Gas and blower turns on or off. Unit runs in highest flame setting always. Blower runs at pre-selected speed. Two Stage Furnaces: Burners cycle between high or low flame setting, as needed. Can be 80% AFUE up to 95% AFUE. Blower can be found in variable speed configuration or single speed. A single speed furnace actually has more blower speeds that can be selected by changing a blower wire to a different electrical tap or by different dip switch settings. Modulating Gas Furnaces: Up to 98.2% AFUE. The burners increase or decrease in increments. Room temperature seldom varies more than a couple degrees from the thermostat set point. Variable speed blower helps immensely to balance temperatures across the conditioned space. Many homes nowadays are equipped with a "smart" home control system, which can control temperature, humidity, and many other functions of a home. These systems can be accessed from your home computer or remote laptop to monitor or adjust any and all functions of the home's comfort system(s). The very least a home should be equipped with is a digital programmable thermostat. This thermostat can be programmed for various times of day to adjust the temperature of the home during varying use periods, such as nighttime, or when everyone is gone at work and school. These thermostats can also be programmed for a different schedule on the weekends. There are models which will work on every type of furnace. A digital programmable thermostat can be one of the best ways to save on your utility bills, depending upon your family's habits or schedules. Most families set back temperatures during the sleeping hours. 15 minutes before the family climbs out of bed, the modulating furnace is called into action. The unit starts out at the highest flame and blower settings. At this point, the system acts very much like the single stage gas furnaces you grew up with. As the call for heat is satisfied, the modulating gas valve and the variable speed blower begin to throttle back until the thermostatic call is satisfied, and the unit completely shuts off until it is called into action again. 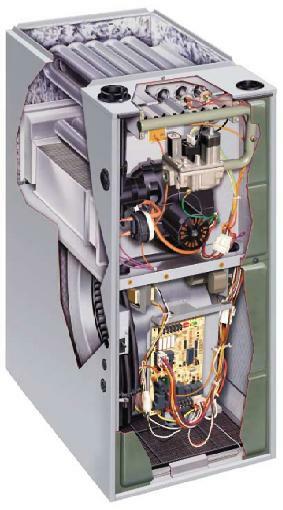 Installation of a modulating gas furnace in your home is not an economical expenditure. Expect to pay $4,000. to $5,000. for a retrofit installation. You can expect that to recoup the increased installation cost will take ten years or more! But there are those bragging rights, and the knowledge that your green eco-friendly purchase has lessened your impact on our environment.